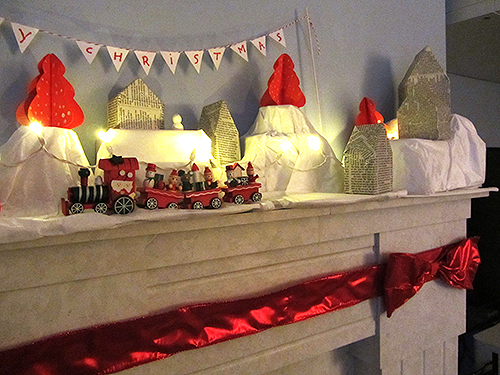 Here is what I came up with to make my mantel piece more christmassy (and also to balance the infamous Advent Calendar aura). The red and white winter scene is made of bits and piece I was given, bought or found how-tos on the web. Here is how. First of all the scene is set on a ground of boxes covered in tissue paper to create some levels and a snowy feeling. The ribbon and bow are made with some large wired satin ribbon. Everything is stuck into place thanks to double sided tape. The little houses are made using Bella Dia’s cereal box house tutorial. They have been covered in news paper and a good quantity of mod podge. The trees are in red light cardboard with my own template but inspired by Creativ Company method to make a card tree. I have dotted some of the layers with a white marker. 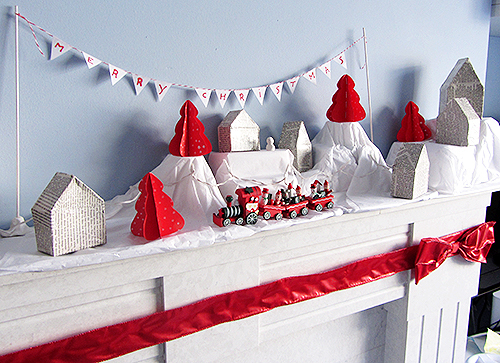 The bunting is made of plain paper triangles stuck on the red and white baker’s twine with basic sticky tape. The poles are bamboo kebab skewers painted in white and stuck in polymer clay bases. The snowman is a polymer clay one and in bad need of some arms and baking. The train was in a parcel sent by my dad, I love the traditional feeling and how happy the little people look, probably on their way to Santa’s land. Finally a battery operated led garland runs in the middle of the scene. I still need to work on this, probably by adding another garland. Anyway how did we make Christmas lighting before these LEDs came along?